Election 2019 Live: The verbal war between Congress and AAP continued till late night with Ahmed Patel being the latest leader to hint that 3:4 Delhi formula is the final deal for Arvind Kejriwal's party. "Our proposition still stands, the ball is in their court," he said. Earlier, senior Congress leader Ajay Maken tweeted vote share tally to answer Aam Aadmi Party's question on why Congress was offering it 3:4 formula. Two days after Congress decided to go solo in Delhi, party president Rahul Gandhi, in a surprise offer to Arvind Kejriwal, said that they are willingly to give up four seats in the national capital for AAP to "ensure BJP's rout". "An alliance between the Congress & AAP in Delhi would mean the rout of the BJP. The Congress is willing to give up 4 Delhi seats to the AAP to ensure this. But, Mr Kejriwal has done yet another U turn! Our doors are still open, but the clock is running out," he tweeted. Since, then there has been a war of words between Congress and Kejriwal's party over the "show-off" seat-sharing formula. BJP Will File Complaint With EC, Says Vinod Tawade | BJP's Vinod Tawade alleges that Congress workers were responsible for the scuffle between the workers of both parties during Urmila Matondkar's rally in Maharashtra. "Rail passengers were chanting slogans of 'Modi-Modi'.Congress workers roughed them up. One woman was beaten," he said adding that the "BJP will file a complaint with the Election Commission". Congress MP Sanjay Sinh in a tweet hailed the EC's decision to ban Maneka Gandhi from campaigning for 48 hours. "A worthy lesson handed out by EC & another befitting lesson will be taught by Sultanpur to put such arrogance and bias in its place!" he wrote in the tweet. Our Proposition Still Stands, Ball Is In Their Court, Says Ahmed Patel | Congress veteran leader Ahmed Patel says that the party overcame opposition from its state unite to work out a formula with AAP. "We wish to set the record straight, despite opposition from our state unit, Congress President convinced them to work out a formula to collaborate with AAP in Delhi. But AAP insisted for seats in Haryana. Our proposition still stands, the ball is in their court," he tweeted. JJP Leader to Campaign During Furlough From Tihar Jail | Former MP Ajay Chautala, who came out on a three-week furlough from Tihar jail today, will be campaigning for Jannayak Janata Party (JJP) candidates in Haryana for the Lok Sabha polls. The JJP will be holding a meeting of its core committee on Tuesday and will deliberate on prospective candidates for the general elections. 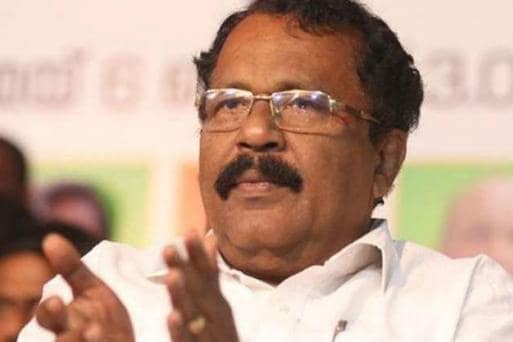 The Opposition in Kerela termed PS Sreedharan Pillai's remark on Balakot air strike, which he denies having made, as an insult to the Muslim community and has demanded a public apology. "I have been denied the fundamental right of freedom of speech and expression. 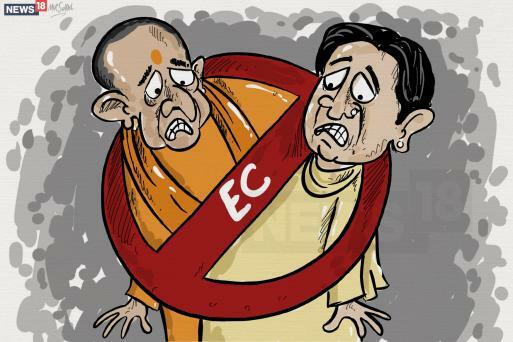 This day will be known as a black day in the history of EC," Mayawati says in the press conference. Maneka Gandhi Banned From Campaigning For 48 hrs | The poll body has also taken an action against Union Minister Maneka Gandhi from contesting for 48 hours. The action comes over the BJP leader's remarks urging Muslims in Turab Khani village to vote for her if they want to get employment. Can't Go to Agra Rally Because of EC's anti-Dalit Mentality | "PM Modi is using the army for votes. But EC is not taking any action even after repeated warnings," Mayawati says and adds, "This (the ban) shows the anti-Dalit mentality of EC. I can't go to Agra rally tomorrow because of the anti-Dalit mentality of the EC." Meanwhile, in the Lucknow presser BSP supremo Mayawati says, "The ban on UP CM is just an eye wash. The real person who violated MCC is PM Modi. But EC is not able to do anything." Azam Khan Barred From Campaigning For 72 hrs | Even as the BSP supremo addresses a presser on the poll's body order, the Election Commission has issued a direction banning SP veteran leader Azam Khan from campaigning for 72 hours. Hitting out at the Modi-led Centre Mayawati says, "The whole country knows that the government has failed in the last five years. Modi has been trying to manipulate the people by using the martyrs from the Pulwama terror attack and tugging on communal sentiments." "As a result of this ban, I will not be able to appeal to the Bahujan community in the Agra rally tomorrow," the BSP chief says. "This could've been enforced a day later," she says accusing the EC of bias. "Meanwhile, Narendra Modi and Amit Shah have been given a free-run." "I am being deprived of my Constitutional right that was given by BR Ambedkar," Mayawati says. "The deprived and marginalised communities will never forget this," she adds. EC Notice Does Not Say Comment Was Meant to Provoke, Says Mayawati | BSP supremo Mayawati is holding a press conference in Lucknow over EC's ban . After reading out the poll body's direction over her Deoband rally remarks Mayawati says, "Notice does not say that my comments were meant to provoke. Their only justification is that I was urging one community to vote for us." Hitting out at the BJP, Biju Janata Dal (BJD) president and Chief Minister Naveen Patnaik accuses the PM Modi-led Centre of having no sympathy towards the farmers of Odisha. "The central government has no time to deal with the the problems of Odisha farmers," Patnaik says in his address in a series of election meetings at Atabira, Padmapur and Bargarh, where polling is scheduled to take place on April 18. Lok Sabha speaker and BJP leader Sumitra Mahajan also hit out at SP veteran leader Azam Khan over his remarks against Jaya Pradaji and said that he had "crossed all limits of disrespect to women". "I hate to hear such words. Such thinking is a taint on humanity. Politics and elections have their place, but everyone should stay within their limits." Congress leader Ajay Maken in a tweet justifies the party's decision to settle on a 3-4 arrangement with AAP and cites the 2017 Municipal Elections. Why 4-3 formula between AAP-INC? China, Pakistan Cannot Afford to Indulge in Misadventures, Says Yogi | Uttar Pradesh CM Yogi Adityanath in rallies in Rourkela, Angul and Phulbani accused Congress of being "soft" towards terrorism. "Pakistan was beheading our soldiers on the border during the UPA rule. Now with Modi as the prime minister, China and Pakistan cannot afford to indulge in misadventures," he said. Congress' Delhi in-charge PC Chacko responds to AAP's criticism of Rahul Gandhi "offer" of 4 seats in Delhi and says, "Let us come together in Delhi first." "Rahul ji said our doors are open, it should be done. Whatever decision is reached in one state cannot be replicated in the same way in other states," he adds. The EC in its order said it was convinced that both the leaders 'made highly provocative speech which has the tone and tenor to aggravate existing differences or create mutual hatred between different religious communities'. The BJP is likely to challenge the EC order banning Uttar Pradesh CM Yogi Adityanath from campaigning. The legal department of the party is said to be looking into any option available to appeal the ban. Amit Shah also slammed the Congress and its leadership, including president Rahul for spreading lies on the Rafale deal. "Spreading lies was ingrained in the Congress culture," he says. Addressing a rally in Gujarat's Kodinar district BJP president Amit Shah says, "SP leader Azam Khan’s misogynistic comments on BJP candidate Jaya Prada shows the opposition parties’ brazen disrespect for women." YSR Congress Party in a letter to the Election Commission called the poll body's attention on the instances of violence in Andhra Pradesh's Guntur and Chittoor districts during the first phase of polling. "So far the culprits are not arrested in either of the cases," the letter reads after implicating the rival Telugu Desam Party. The Jaggan Mohan Reddy-led party in the letter requested that the Commission to install CCTV cameras and round the clock and upgrade the security of the strong rooms. Union Minister Mukhtar Naqvi hits out at Rahul Gandhi over his "all Modis are thieves" remark. "Modi ji comes from a backward community, people with feudal mindset have hatred towards him. We've appealed to EC to take action against Rahul ji and Congress," he says after a meeting with the Election Commission. You Are Not Serious About Coalition, Says AAP Chief | Aam Admi Party chief Arvind Kejriwal also slams Rahul Gandhi and asks him what "u-turn" he is referring to when the conversation over the alliance is ongoing. "Your tweet shows that the alliance is not something you want but is only for show. I am sad that you are just making statements. Today, you have the desperately want to save the country from the danger of Modi-Shah. Unfortunately, you are helping Modiji by distributing anti-Modi votes in UP and other states too," he tweets. Congress's Shakeel Ahmad in a tweet said that he is tendering his resignation because of his nomination filing from Madhubani Parliamentary constituency. "As I have decided to file my nomination papers tomorrow from Madhubani Parliamentary Constituency in Bihar, I’m resigning from the post of Senior Spokesperson of AICC. I’m sending my resignation to Congress President Shri Rahul Gandhi." As I have decided to file my nomination papers tomorrow from Madhubani Parliamentary Constituency in Bihar, I’m resigning from the post of Senior Spokesperson of AICC. I’m sending my resignation to Congress President Shri @RahulGandhi . AAP leader Gopal Rai also reacts to Rahul Gandhi's tweet and says, "Why isn't @Rahul Gandhi interested in defeating BJP on 18 seats. @Rahul Gandhi had opened doors to 4 seats, then we have opened the doors to 18 seats in Delhi, Haryana and Chandigarh." AAP spokesperson and MP Sanjay Singh hits out at Congress over Rahul Gandhi's tweet and says, "In Punjab, where there are four MP and 20 MLAs from AAP, Congress does not want to give a single seat. In Haryana, where Congress has one MP there too they do not want to give a seat. In Delhi where there are 0 Congress MLA and 0 MP there, you want to give us 3 seats. Is this what happens in a settlement? Why do not you want to stop the BJP in other states?" Ahmed Patel shows the BJP and Congress manifestos at a press conference in Delhi on Monday. Bahujan Samaj Party chief Mayawati on Monday evening condemned the EC ban on her campaigning ahead of crucial second phase on voting. "The poll body order deprives me of my Constitutional right, while Modi and Amit Shah are given a free run," she said, requesting people to turn up for SP-BSP-RLD rallies in large numbers. Samajwadi Party chief Akhilesh Yadav today defended Azam Khan's derogatory remark on BJP leader Jaya Prada. "He was talking about someone else. We are Samajwadis, we never use foul language for women," he said. Later, when reporters asked Khan about NCW notice served to him in connection with the controversial comment, the infuriated leader said, "Aapke walid ke maut me aaya hun (I have come at your father's death)." He was in MP's Vidisha for last rites of former Rajya Sabha MP Munawwar Salim, who had passed away earlier today. The Supreme Court on Monday ordered Congress chief Rahul Gandhi to explain why he attributed his ‘Chowkidar Chor Hai’ jibe against Prime Minister Narendra Modi to the top court. “We only looked at the admissibility of the documents. We didn’t say what has been attributed to us by Gandhi. The alleged statement has been wrongly attributed to the court,” the Supreme Court said, issuing a notice to the Congress chief. The court also criticised the Election Commission for its inaction on hate speeches by netas, citing the instances of Uttar Pradesh chief minister Yogi Adityanath and BSP supremo Mayawati, while sending a notice to the EC on a plea seeking directions to bring political parties under the ambit of RTI. Meanwhile, Rahul Gandhi reached Fatehpur Sikri in UP’s Agra to campaign for Congress candidate Raj Babbar alongwith his sister and Congress eastern UP incharge Priyanka Gandhi Vadra. He will visit Uttar Pradesh, Gujarat, Maharashtra and Kerala from where he is also contesting. Former Jammu and Kashmir chief minister Mehbooba Mufti will hold a rally at 11am, while National Conference leader Omar Abdullah will address a public meeting at 2pm in Ganderbal. Samajwadi Party chief Akhilesh Yadav will be campaigning in Kasganj and Muradabad. On the issue of biopics, the Supreme Court asked the makers of PM Narendra Modi to screen the political biographical drama for the Election Commission. The Supreme Court has directed the EC to watch the Vivek Oberoi-starrer and then take a call on whether or not it should be banned.